Free Guitar Lessons. Discover Which One Of Our Mini Courses Is Right For You. Each one of these mini courses includes a series of structured and easy to follow video lessons, that will take you on short and fun journey to building your guitar playing skills, confidence and motivation. If you’re a complete beginner, just starting out on your guitar playing journey, or if it’s been a while since you picked up the guitar and are looking to regain some confidence and motivation, then 6-Week Guitar is for you. 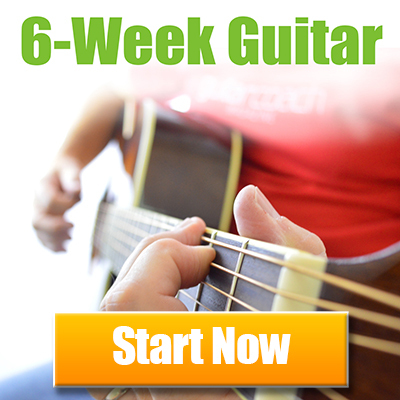 In this free 6 week guitar course, you’ll quickly master the basics and then dive right into playing songs. So you’ll experience real results, fast. You’ll be learning chords, developing your fretting skills and getting into some cool strumming patterns, following a clearly structured route map. The 6-week guitar includes a course guide, tab book, chord charts, practice planner and backing tracks, so it’s really comprehensive, yet easy to follow and a great foundation to playing guitar. 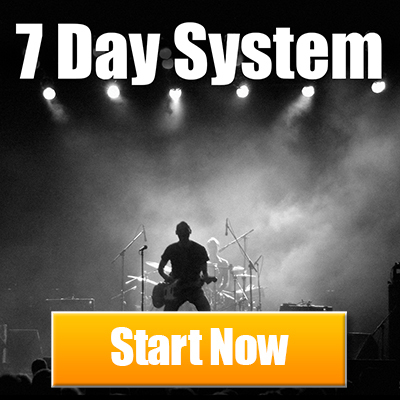 The 7 Day System is for guitarists who know the basics and can play open chords and a few barre chords, but are now wanting to develop their strumming, rhythm and timing, as well as play more songs. The 7 day system, is the same system I use when learning to play any new songs for my band. So I’ll be sharing with you all my best secrets, tips and shortcuts to learning songs, fast. Plus as you progress through the 7 days, we’ll be working towards a jam session where you be joining me and my full band. And if you’ve never tried this before, then I guarantee you’re in for a treat. So if you want to be a more confident guitarist, and learn more songs, then this free course is for you. These motivation boosting Classic Riffs are not only great for sounding awesome, and impressing friends and family, but you’ll also be refining your playing techniques, accuracy, rhythm and timing! 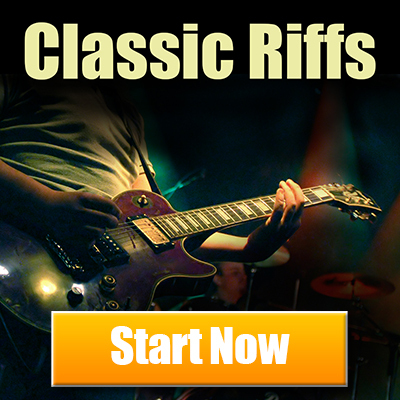 With these classic riffs, there’s a Tab book and detailed video training to guide you through these riffs note by note, so you start having some real fun straight away. These riffs are also great as fun warm up routines, as you’ll be cramming in a whole range of skills and techniques into just a few minutes of playing. So if you want to have some fun and sound awesome, as well as ramp up your confidence and accuracy, then the Classic Riffs are for you. I payed for a guitar riff course as a longtime member and now I can’t access. I have mentioned in an email and no help was given. I have purchased your Guitarcoach 6 Week Gitar Volume 1. Is it merely like a book that I download and read ti follow? I have played AT guitar for forty years, but I’m not smooth and especially since I have had two strokes that have really seemed to bother my left hand maneuverability. Can you give me more information about the course that offers the charts on inversions that lead me to this page of lessons? How can I subscribe to the magazine? the magazine is available free of charge on both iOS and Android devices.